Edition of approximately 300 signed and dated '64 in pen lower right; some signed in pencil. The present work is one of only seven monumental-scale paintings from Andy Warhol's famous Flowers series, which the artist showed at a sell-out exhibition at the Leo Castelli Gallery in New York in 1964 and with Galerie Sonnabend in Paris in May 1965. 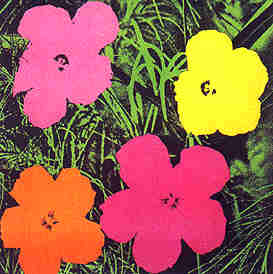 The two shows comprised of densely hung canvases of flowers in various sizes and brilliant Day-Glo hues, all appropriated by Warhol from a photograph of hibiscus blossoms that had appeared in the June 1964 issue of Popular Photography. Warhol was at the height of his creative powers and international fame, and as David Bourdon writes, the "cheerful and refreshing Flowers series includes some of Warhol's most lushly colored, decorative, and ingratiating paintings." (D. Bourdon, Warhol, New York 1989, p. 191). The idea to paint flowers as the subject of a major series was apparently suggested to Warhol by Henry Geldzahler, then curator at the Metropolitan Museum in New York. To some degree, the pictures belong to a long art historical tradition of still-life painting. "With the Flowers, Andy was just trying a different subject matter. In a funny way, he was kind of repeating the history of art. It was like, now we're doing my Flower period! Like Monet's water lillies, Van Gogh's flowers, the genre." (Gerard Malanga as cited in A Year in the Life of Andy Warhol, New York 2003, p. 74). Warhol's updated version is consciously banal, superficial, synthetic and enchantingly beautiful. Quintessentially sixties in their colors and floppy petal shapes - an early signal for the flower power generation - Flowers can also be viewed as an attempt by Warhol to create a truly "Popular" art. Dealer Ivan Karp recalls, "It was not an earthshaking photograph, but Warhol made a remarkable series of paintings out of it. Whatever, they were totally successful and we sold them all! And you could keep selling them right now! That's it. That's one of those immortal images. You know? He just found it. Right? It was a grand success." (Ivan Karp, interviewed in P. Smith, Andy Warhol's Art and Films, 1986, p. 358.). The simplicity of the image, bright and flat, meant that these instantly accessible paintings were easy to serialize. Warhol had declared his wish to be a machine and to remove himself as much as possible from the artistic process and from the work of art itself. Between June and July 1964, his "Factory" studio became an assembly line dedicated to the fabrication of Flowers. As photographs document, Warhol worked on the Large Flowers paintings himself, but he employed a legion of assistants to manufacture an estimated total of 900 smaller Flowers, finishing as many as eighty per day. "Friends come over to the Factory and do the work with me," Warhol said. "Sometimes there'll be as many as fifteen people in the afternoon, filling in the colors and stretching the canvases." (Op. cit, p. 193). The Flowers paintings followed Warhol's Death and Disaster series of 1962-1963--sensational images of electric chairs, suicides and horrendous car-crashes. While the Flowers can be seen as the vacuous flip-side of this horror and violence, there are some critics who believe that they are still permeated by Warhol's deep obsession with death. "What is incredible about the best of the flower paintings (especially the large ones) is that they present a distillation of much of the strength of Warhol's art--the flash of beauty that suddenly becomes tragic under the viewer's gaze. The garish and brilliantly colored flowers always gravitate toward the surrounding blackness and finally end up in a sea of morbidity. No matter how much one wishes these flowers to remain beautiful they perish under one's gaze, as if haunted by death." (J. Coplans, "Andy Warhol: The Art", Andy Warhol, exh. cat., Pasadena Art Museum, 1970, p.52). David Bourdon has described the Flowers as "cut-out gouaches by Matisse set adrift on Monet's lily pond". The massive red and blue petals in Flowers,, the color being hand-painted and the black silkscreened slightly off-register, appear to float off the canvas, as if somehow disembodied from the blurry black-and-white background. "Some viewers perceived the blossoms as hovering in front of the canvas, while others saw them as occupying a vertical plane behind the canvas. In fact, the illusion that the floating blossoms do not occupy the same surface as the background (particularly effective in the larger paintings), was created by the intensity of the chroma contrast, a striking demonstration of the ability of colors to suggest advancing or receding planes." (Bourdon, p.193) (http://www.invaluable.com/catalog/viewLot.cfm?lotCode=8UIF2XOC&lotType=artist&aID=10873).